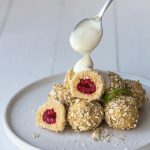 Hungarian vegan curd cheese dumplings. What kind of dumplings? Curd cheese is not known in many countries but it is a traditional ingredient for this recipe. But in my recipe, I use millet and polenta to make the vegan version. This is also a gluten-free version! Yay! I used to eat this dessert often when I was a child. Since going vegan I have only eaten it once at a vegan restaurant in Budapest. Check out my vegan food guide for Budapest here. Finally, I can eat these dumplings anytime now as this recipe is so simple and quick to make. Just make sure to think ahead as you need to soak in the millet. 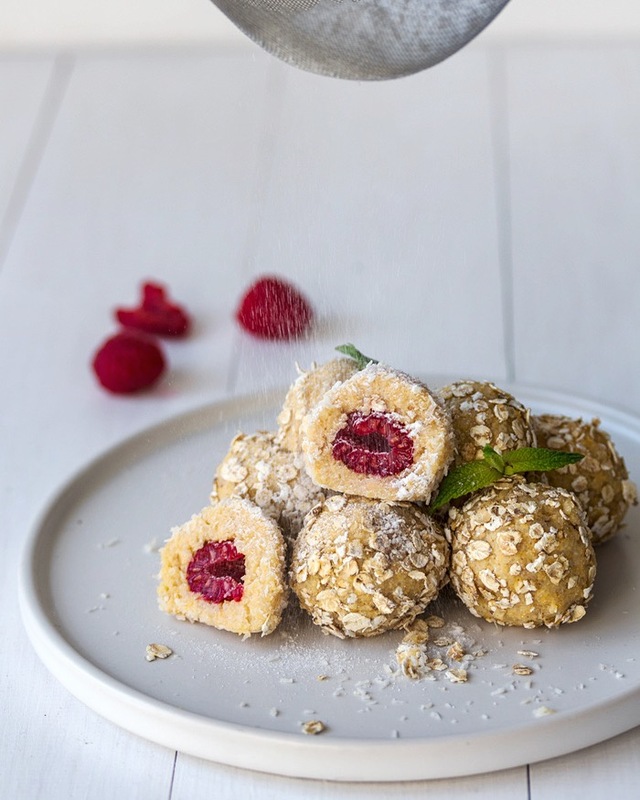 Traditionally they are rolled into toasted breadcrumbs and served with sweet sour cream but I wanted to make a healthier version. 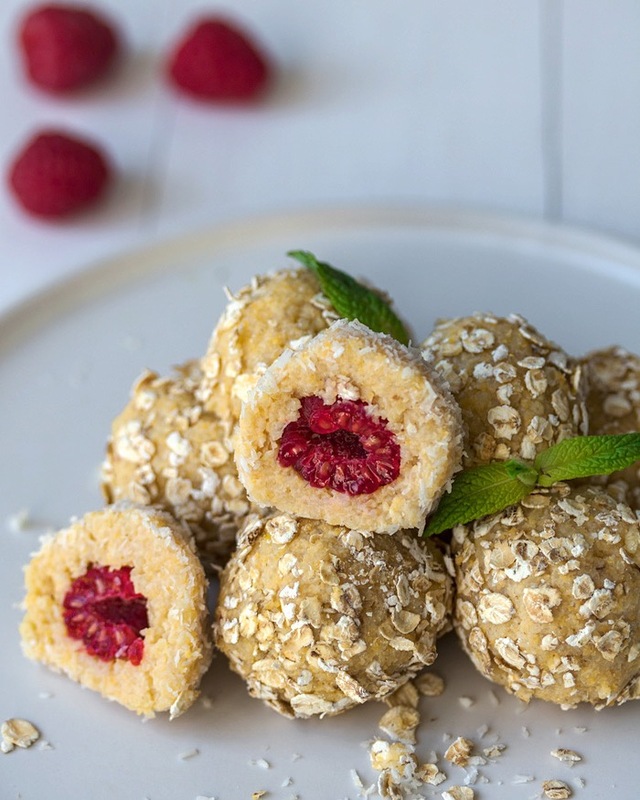 I rolled them into instant oats & desiccated coconut and served them with soy yogurt. They are commonly not filled but I thought this would make them even better. Make sure that your raspberry jam is not too runny. You can use any kind of jam you like. First, you need to *soak your millet in cold water for at least 5 hours. Then you need to it them a few times. Put your millet and milk a in larger pot and bring to boil. Add the water and let it simmer. Before the millet gets very soft add the polenta or semolina and stir well. Add more milk if needed. Cook until it gets thick and the millet turns nice and soft. Just add some more liquid if needed but you want a nice and thick “dough”. Turn the heat off and add the juice and zest of the lemon, the vanilla and the sugar or syrup your choice. Add as much as you like. I used date syrup and I personally don’t like it too sweet. Let it cool for around 20 minutes. Prepare your oats and coconut. With wet hands shape little balls and fill them with either jam or raspberries. Don’t use too much jam. 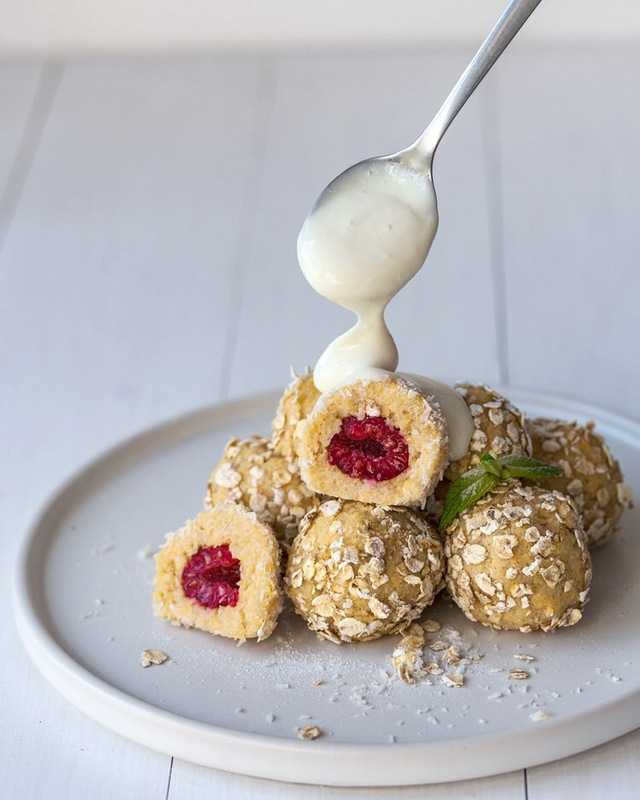 Roll your dumplings into instants oats or desiccated coconut and serve with some soy yogurt. I also mixed some vanilla in my yogurt but if you like it sweeter and some sugar or syrup. You can also eat them fresh but I personally prefer them the next day cold. *soaking your millet will make it much easier to digest. I found a link where you can see traditional Hungarian food, imagine that all of this can be made vegan! Which one would you try first?